Fort De Soto is one of my favorite places to photograph in springtime, so when the calendar changed to April, it was time to make a visit. I started out at East Beach for sunrise, headed to North Beach for shorebirds, and then ended the morning at the mulberry trees in search of migrants. It felt so good to be out enjoying springtime! I had checked the angle of the sunrise before going, so I know that it wasn’t the right time of year to try for the sunrise in between the arches of the Sunshine Skyway. So I found a pretty spot on East Beach with some sea grasses in the foreground. There were tons of gulls and terns and pelicans on the water, all calling like crazy. Early morning fishermen were already at work, and a few people had boats out on the water. A cool breeze made it just perfect to be out! I shot a bunch of frames for HDR composites, although my favorite shot ended up being a simple crop with no HDR. You see, breeze feels wonderful against your face, but plays havoc with the HDR alignment! Also the birds were moving so much that the HDR program basically ghosted them all out. I still can’t get over how much North Beach has changed in the past year or two. All the invasive Australian Pine trees are gone, and the beach was significantly re-shaped by the tropical storms. 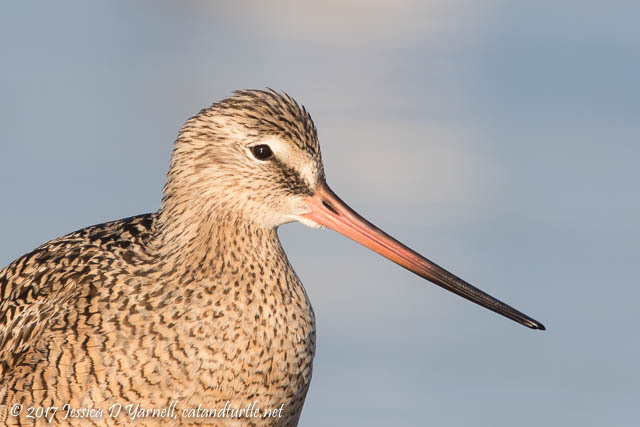 So I wasn’t sure what to expect in terms of shorebirds. 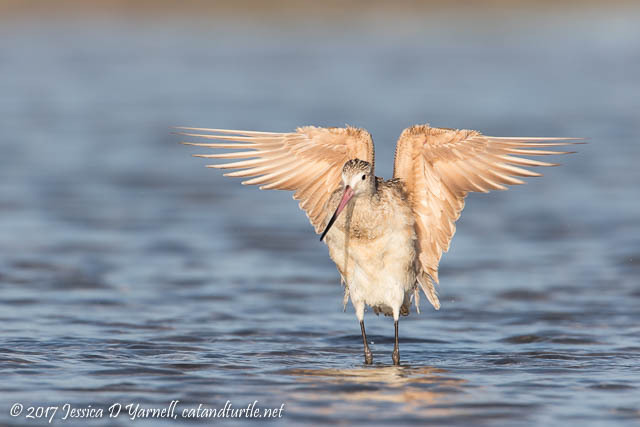 I headed out to the lagoon and was happy to find a small flock. “Just a bunch of seagulls,” said a few guys who passed me. Not when I got there! 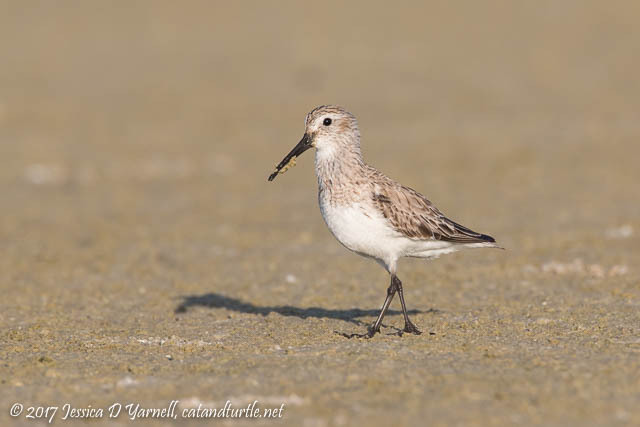 A Western Sandpiper ran along the mud flat, using his long beak to find his breakfast. He’ll soon be on the way to the northern shores of Alaska to breed. Maybe Debbie will see him there on her next visit! “Nuh-uh-nuh-uh” came the familiar sound of Laughing Gulls as they ensured the survival of their species. 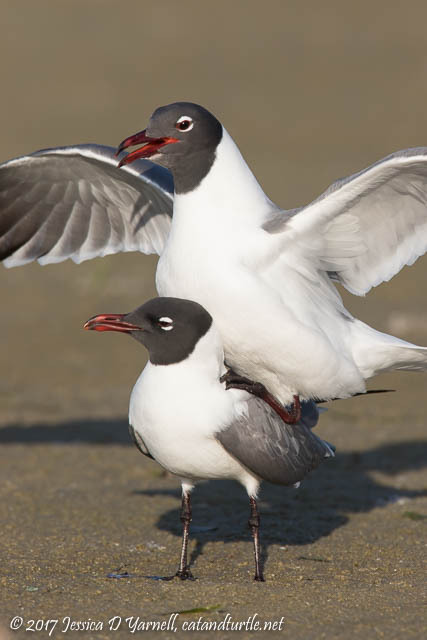 Never fear, there will be plenty of Laughing Gulls to steal your fries at the North Beach concession stand this summer! Of course I had way too much lens for the birds right in front of me…it’s sweet to see the birds nuzzling their beaks while they <ahem> take a piggy-back ride. 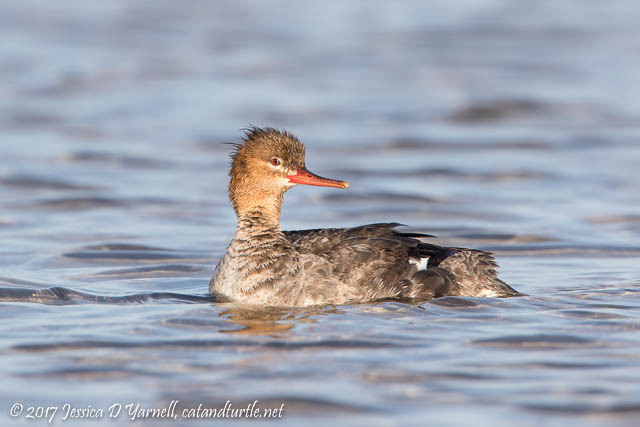 A Red-breasted Merganser swam up as I stood in the water. She came quite close. 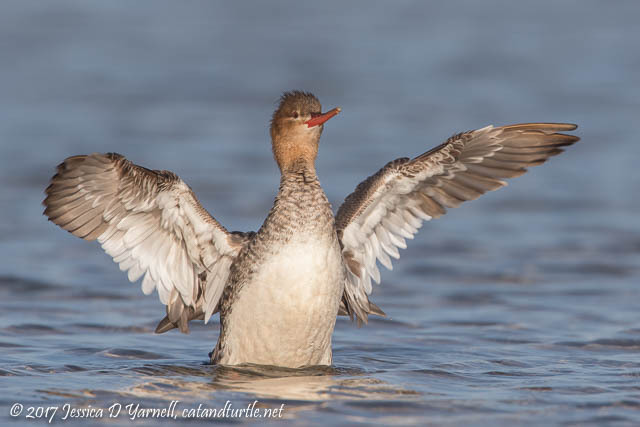 I’ve seen tons of female mergansers at Fort de Soto, and a juvenile male, but never an adult male. One of these years a male will surprise me. She must have been an exceptionally dirty bird because she bathed herself over and over again. I wasn’t complaining. More baths mean more wing-flaps. She looks like she’s leading an orchestra of peeps in this one! Finally I left the lagoon and made my way south towards the bird conservation area, marveling at how the storms re-shaped the beach last year. I came across this calico crab who was pretty as the tide ebbed and flowed around him. Inside the conservation area, lots of Black Skimmers, Royal Terns, and Sandwich Terns were making their customary springtime racket. I wished I could get closer to them, but I’m so glad that they have a people-free zone to rest in! 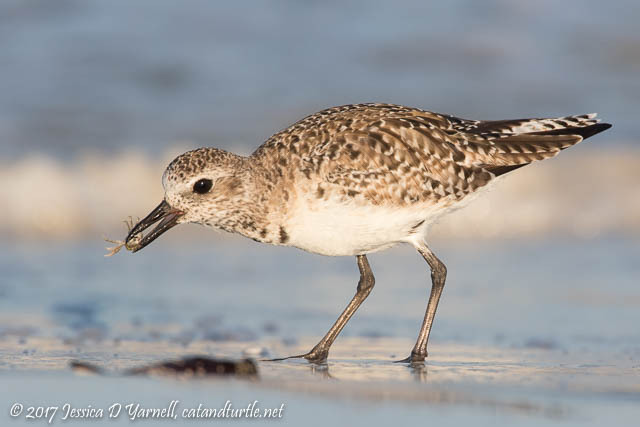 It’s so important to share the beaches with wildlife. 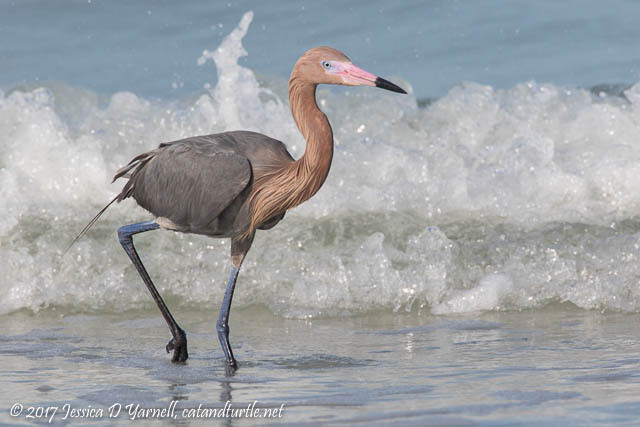 A Reddish Egret, dubbed “Big Red” by the locals, was doing his drunken sailor dance in the surf. He didn’t mind coming right up to the edge of the protected area to pose for me! Check out his breeding colors! 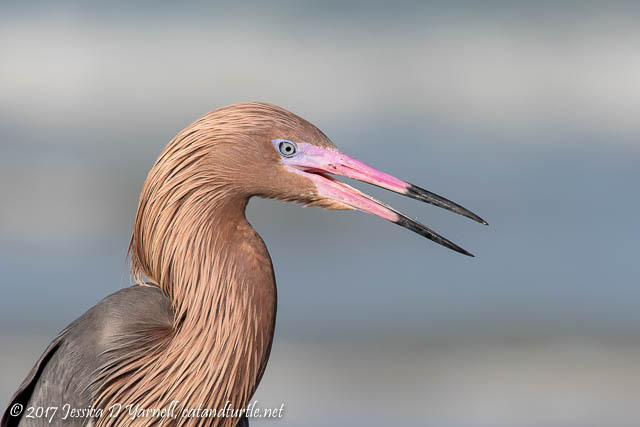 How many birds sport bright blue legs, a hot pink beak, and pretty blue eyes? I stopped by the mulberry trees on my way out. 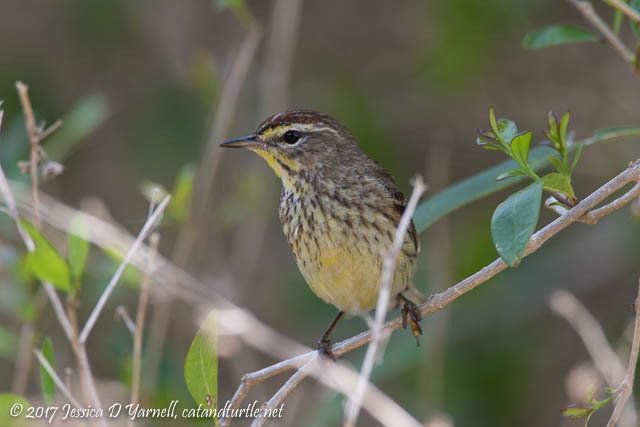 We haven’t had significant migrant activity yet this spring – the warbler counts on eBird seem low to me. So I wasn’t expecting to see much, but hey, it’s always worth a shot, right? Haha, Palm Warblers are hardly the birds that make the mulberry trees famous as a migrant stop-over! It was definitely a slow day. I counted the Palm, a Black-and-white Warbler, a few Fish Crows, two Nanday Parakeets who stayed high in the trees and laughed at me. One Magnificent Frigatebird circled overhead with an Osprey. A Gray Catbird meowed in the bushes. A few White Ibises dropped in for a drink at the fountain. Not exactly the bustle of activity that it can be in springtime. Oh well. 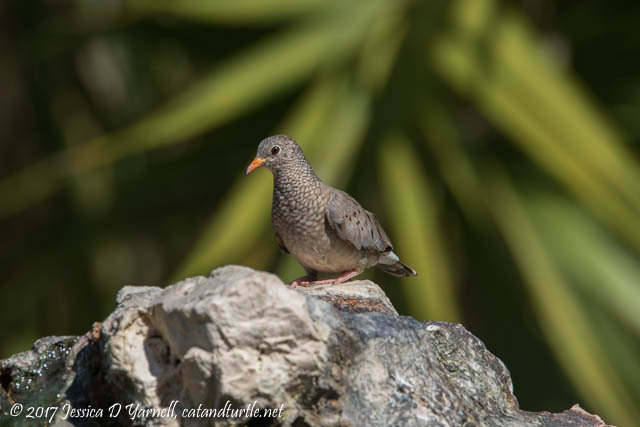 At least the Common Ground Doves enjoyed a drink! 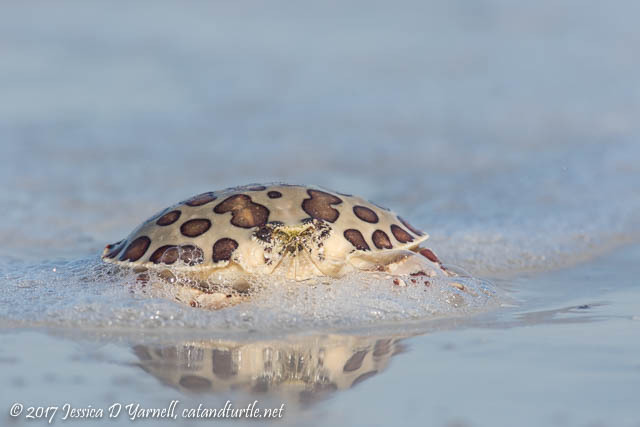 I had never heard of a calico crab until this post. How beautiful! As usual, thanks for sharing. I so enjoy your blog! Looks. Like a great morning. Looking forward to visiting soon. Big Red asked where Michael was. He promised to dance like a drunken sailor for you! I saw my first hummingbirds at Fort DeSoto. They were enjoying the small shrubs by the picnic tables and bathroom, right by the fort.